(just visible: see the enhancement below) lettered either side of the middle loading door displaying the white architect's sign. Above right: the building in 1983. This lettering has been obscured by ivy growth in recent years. 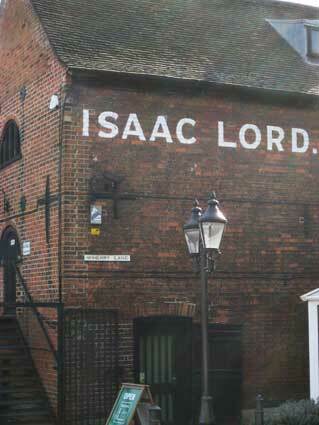 Below: 'ISAAC LORD.' is prominently lettered (and full stopped) at the Salthouse Street end of Wherry Lane above and to the left of The John Russell Gallery. [UPDATE 14 November 2017: Thanks to a tip-off by John Norman, the cannon has been found. 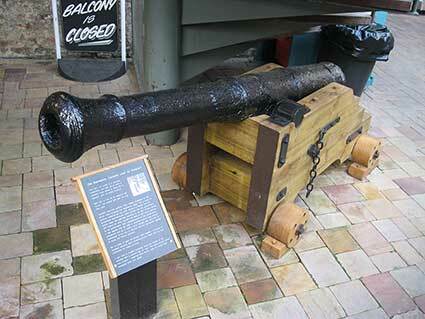 Rescued by the staff of Isaac's, the cannon now has a fine timber carriage and is displayed in the corner of the large courtyard/bar area of the entertainment complex. The photographs below indicate that a surprisingly large portion on the cannon barrel was buried in the ground. Apparently, a car hit the corner of Wherry Lane while travelling southwards down Salthouse Street, demolishing the bollards and uprooting the cannon. 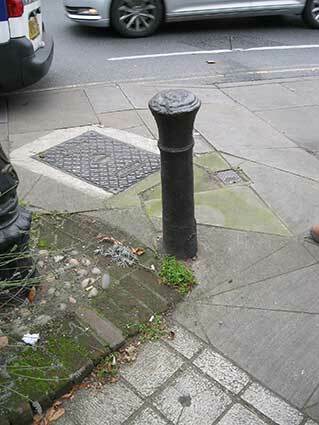 ‘Old Napoleonic Cannons Used As Bollards? This can’t be. Metal is a precious commodity and why would such a laudable large piece of metal be so casually used as street furniture. Well, with a little but of research, we found the answer and, yes, it’s true, they were. 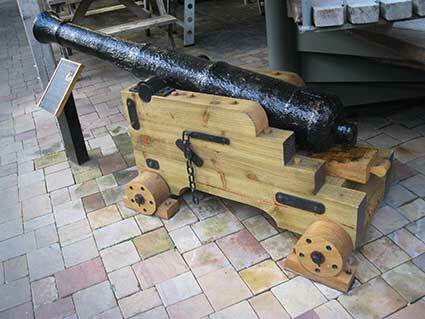 Valuable captured Cannons were indeed scrapped by the British navy following the Napoleonic Wars*. As a result of political lobbying by the arms industry it seems that the armaments manufacturers were worried that the government would reuse the captured cannons for its own military forces, and hence the firms wouldn’t be able to sell more cannons to the government. After representations to the government it was agreed that the loss of business would close several companies and, as a healthy arms industry was (and still is) considered to be vital to national security, parliament agreed to scrap the French cannons. 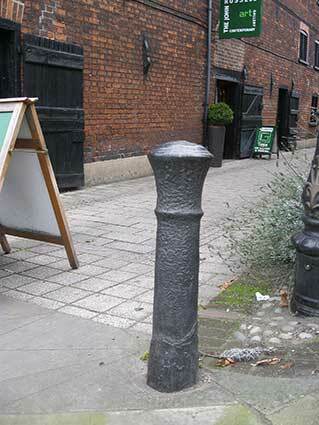 So, in order to save the British arms industry, hundreds of valuable cannons were unceremoniously taken over by local authorities for street furniture. 'In Wherry Lane look out for the sarsen stone (a large piece of sandstone, dredged from the river-bed) and an old cannon used as a bollard. Both are to prevent damage to the walls by horse drawn wagons catching the corner of the building. There are traces of the original cobble paving. On the east side of the lane is a warehouse, today an art gallery, probably of 18th century extended in the 19th towards the quay.' 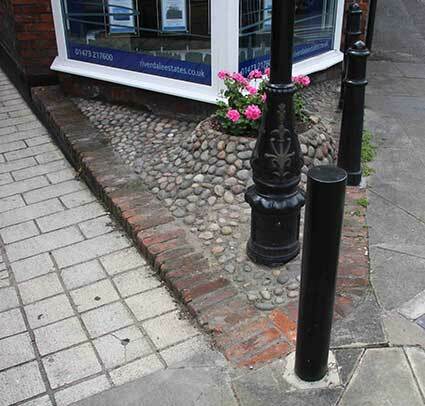 Sadly by 2017 the original cobbles and the cannon-as-street furniture (although two of the new bollards are cannon-like) have been lost. A quirky corner of Ipswich destroyed. 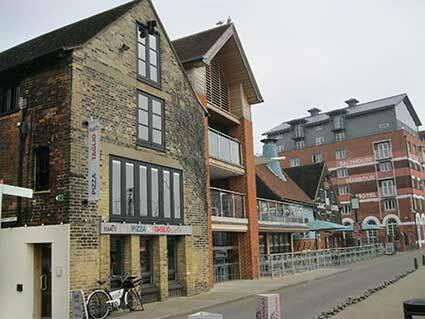 By 2017 the warehouse in the foreground and the new extension which stands on the site of the old Wherry Inn – hence the name of the quay here – are all linked into the Isaac's complex. The Salthouse Hotel is in the background. The not-easy-to-photograph plaque sits high on the wall beneath the kiln vent, in 2017 partially obscured by a giant umbrella. 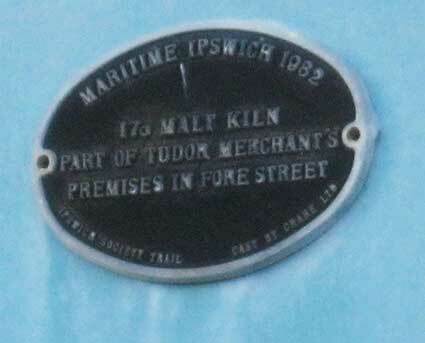 See our plaques page for the full set of ten Ipswich Society Maritime Ipswich 1982 plaques. 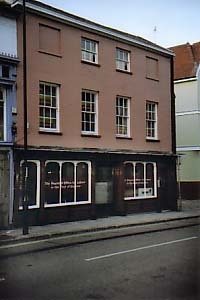 The photograph above shows the whole rake of linked buildings, running back to the merchant's house on Fore Street. The gabled end of the crossway (see here for more information) is half-way down. A 2013 photograph of this area can be seen on our John Good page. 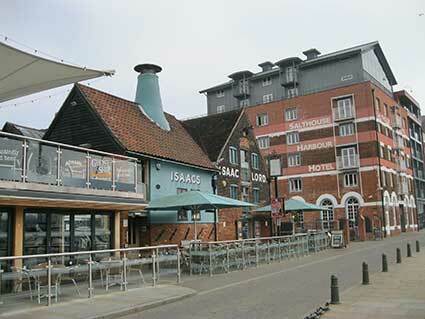 The row of buildings above is the Neptune Cafe, The Old Neptune Inn, unknown building, entrance to Salthouse Hotel and the Isaac Lord building. 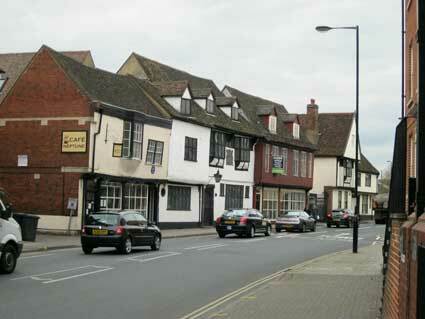 Above right: the Fore Street facade of the Isaac Lord buildings (facing The Lord Nelson pub) which dates back to the time of merchant Henry Tooley (died 1551), benefactor of Tooley's Almshouses in Foundation Steet. The image on the right is from 2011 after the fascade had a facelift; the 'Salthouse' sign on the next door gates can be seen, indicating a hazardous goods entry for the hotel fronting the Wet Dock (see John Good & Sons). Typically, the photograph was taken in a tiny gap in the speeding traffic. 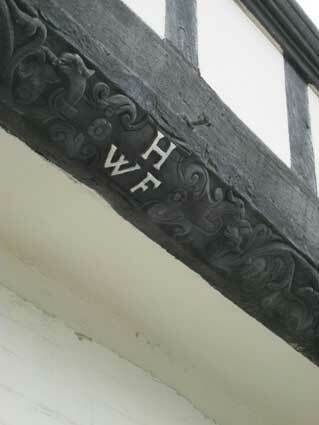 Sadly, researchers into the history of Isaac Lord's are unable to identify the worthy whose initials are 'H.W.F. ', though '1636' is certainly the date of erection of this frontage. On the other side of the archway into the yard is a more modest house facade, which was also owned by the Cooper family. Dendrochronology on this side revealed that an internal beam was felled in the spring of 1478 and so the date of erection was about 1480. 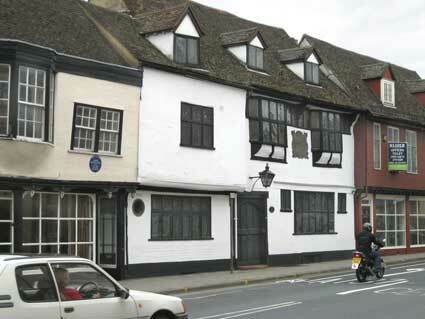 This, in 2002, was claimed to be the oldest surviving and inhabited dwelling house in the town (although now that the Cooper family have moved out, we don't know if the smaller house is occupied). Older than The Ancient House - the core of the oldest part of that building is the 'Chapel Room' leading off the art gallery above Lakeland Kitchenware - and older than The Sun Inn (more recently Atfield & Daughter: collector's bookshop) in St Stephens Lane, another fine old building lovingly restored by the owner family. 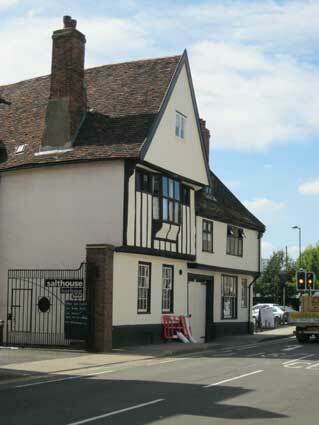 It is arguable that Pykenham's Gatehouse - opposite the County Library in Northgate Street (built in 1471 and famous for its Tudor brick front: all that is visible of the former Archdeacon's Palace) has an earlier claim. But is it a 'house'? Also the cottages behind St Mary at Elms may lay claim to this title: still inhabited and built in 1487. For a nearby dated bressummer, see The Captain's Houses page. 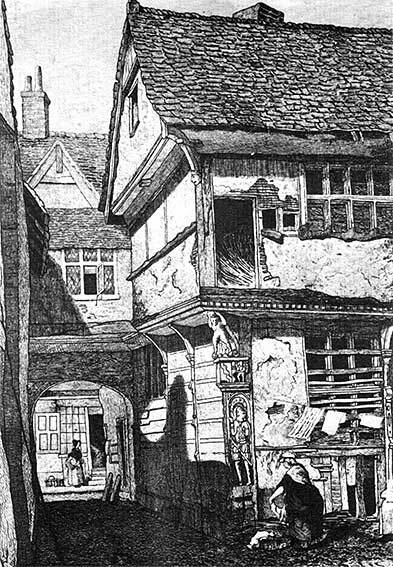 For other dated bressummers in this part of Fore Street see '1639' (Neptune Inn, below) and 1620 above the newsagents at number 132-4. 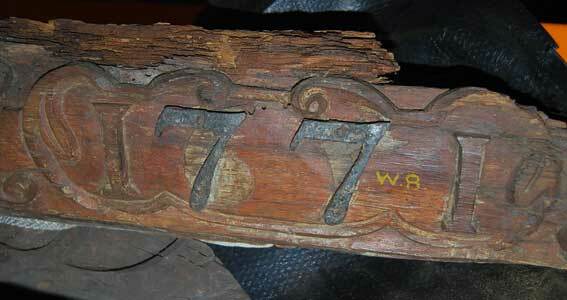 See below also for two further dated timbers from the Ipswich Museum store. It was only in April 2012 that we noticed the nameplate, numeral (80 or 80a?) and bell-pull to the left of the cart entrance. Compare with the lettering on the external water pump in the nearby yard here. Incidentally, the surface inside the gates is composed of end-on wooden blocks; this was to muffle the noise of metalled cart-wheels when they were moved in and out of the yard, so as not to disturb the members of the merchant's household of a nervous disposition. Similar blocks can also be seen in the cartway beneath the Crossway on the farther side of the yard. The above map comes from G.R. Clarke's History (see Reading List) so is pre-1830; rotating it through 90 degrees makes it easier to understand. It shows the 'Road from the Fore Street to the Common Quay' (now known as Salthouse Street, the short S-shaped street linking Fore and Key Streets). 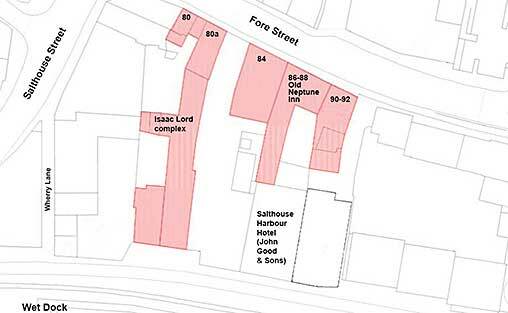 The Salt Office is shown in blue, abutting the dockside. 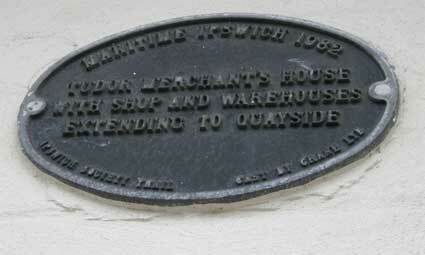 The importance of the salt trade to Ipswich is shown by the street name and the office. Much of the salt brought into the town came from the Tyne; North and South Shields formed the greatest centre in Britain for salt manufacture in the early eighteenth century, with almost 200 saltpans in which seawater was evaporated using the cheap local coal. Salt from the Cheshire salt mines was also brought in here from the Mersey, the rock salt being used mainly for cattle saltlicks and by tanners for the preservation of hides. Wherry Lane is visible on the map ('Lane to the Wherry Inn') running down to the dock. Hog('s) Lane at the upper left no longer exists. Above: a detail from a map of the area dating from 1881. 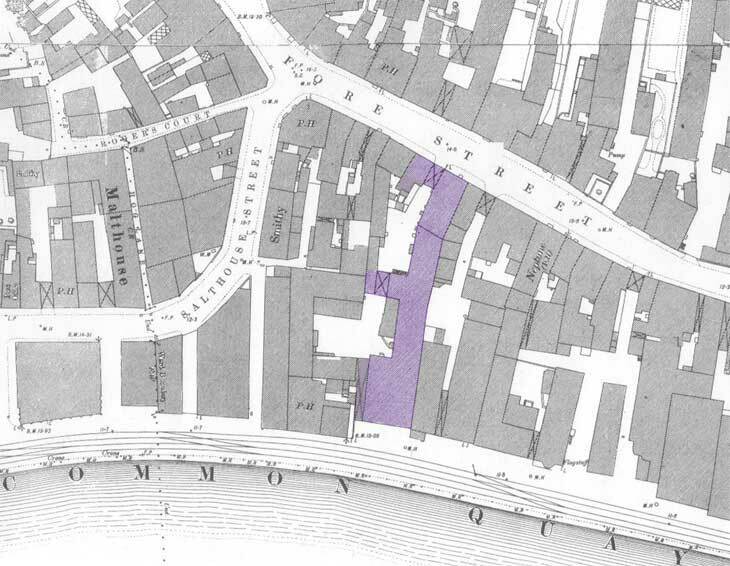 The purple section is the suggested position of the Isaac Lord buildings complex today with the section over the cart entrance on Fore Street not quite matching the plans of the structures on the map and a supposed position of the crossway saleroom halfway down. 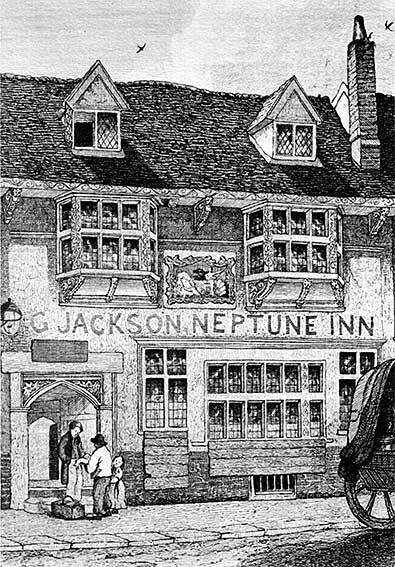 The Neptune Inn is clearly shown with the Lord Nelson marked as 'P.H.' on the opposite side of the road and near to the junction with Salthouse Street. Two other 'P.H.' 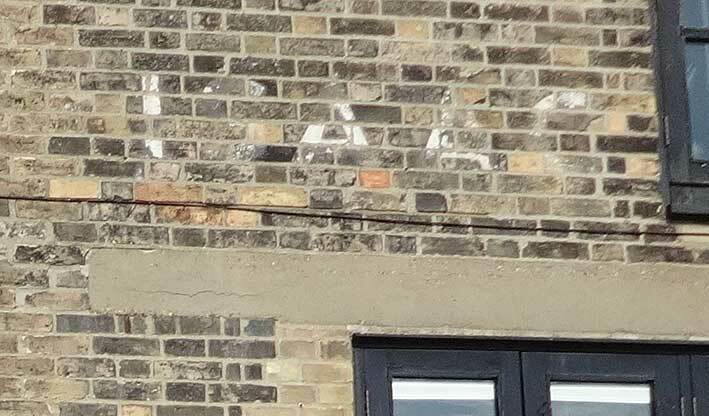 labels indicate that a pub once stood right on the corner which ironically later was the site of a 50s/60s style branch of Lloyds Bank and which in 2013 is a micro brewery. Money and alcohol: two themes intimately entwined with the history of the Wet Dock and its populous. The 'P.H.' on the waterfront to the east of the Isaac Lord building would be The Wherry Inn which gave its name to Wherry Lane which runs northwards to a Smithy and neighbouring building which are long demolished. 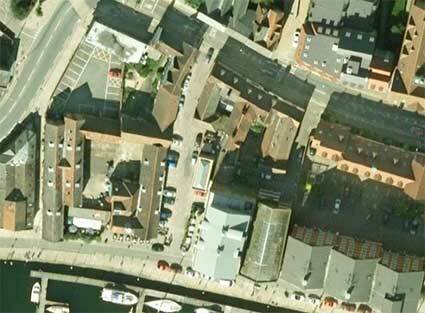 Just west of the three other buildings which remain on the quay in this detail is The Custom House. 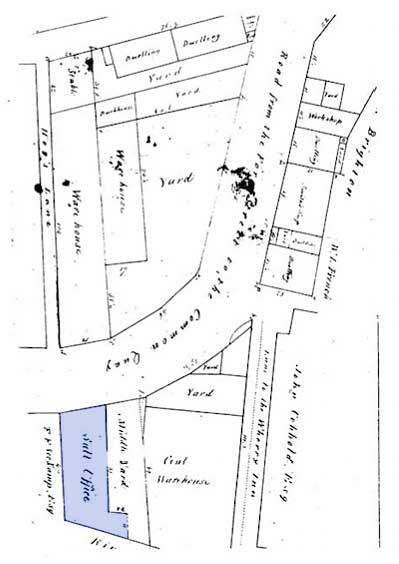 At the far upper left of this detail is the corner of the 'Jews Burial Ground' as it is is labelled in 1881. This tiny walled scrap of history can still be found, today in the middle of a car park. Above: the modern picture showing the Listed buildings in the vicinity in pink. 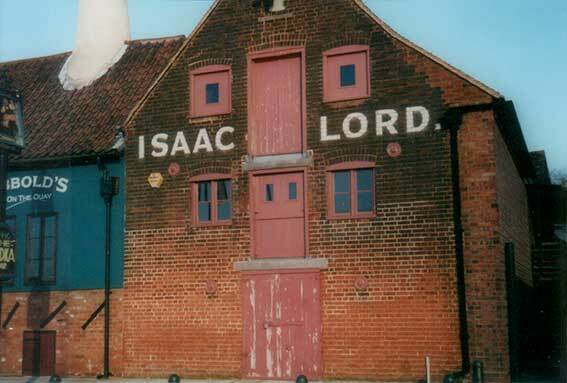 The Isaac Lord story continues for even more on this unique complex of buildings. The former Neptune Inn lies a few doors away from Isaac Lord's. It similarly had a range of buildings running down to the quay but these were sold off at some time. The period picture above shows the tremendous use of painted lettering when the building was a public house. As it ceased to be a pub in 1936, this image must predate that. 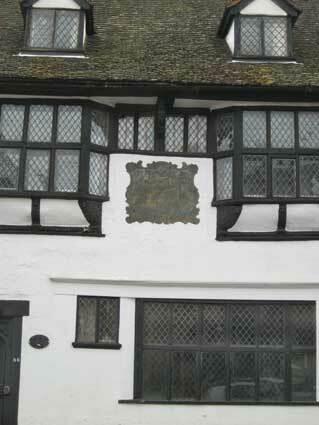 The close-ups show the large date '1639' painted either side of bracket below the eaves with a decorative font and frame and the brewer's name and products above the ground floor window. The delightful use of the small 'AND' inside curving parallel lines give it a flourish, despite the unnecessary full stop at the end. 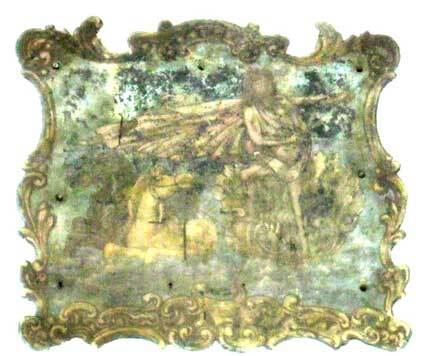 Sadly, all is gone except the tarnished metal plate inn sign (enhanced image below shows a cloaked Neptune with horse at lower left). Originally built in1490, a wealthy wool merchant extended the house and added two floors in 1639. The back of the inn is even older supporting the view that a merchant's house has existed on this site for many hundreds of years. Once a centre for paying off dockworkers on a Saturday night, after its days as a pub, the Neptune was a workplace, then it was bought in 1947 and restored as a home by George Bodley Scott, a director of W.S. Cowell Ltd, an important printer in the town with premises between Buttermarket and Falcon Street. It was later Neptune Antiques. 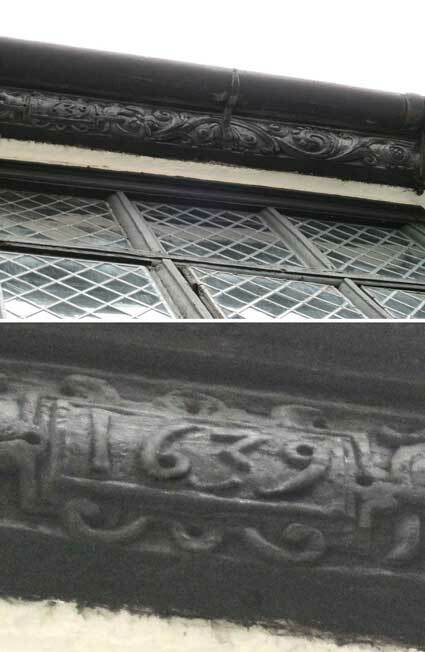 The '1639' date is carved above the first storey widows; it is difficult to make this out from the pavement, particularly with a bright sky behind the building profile. 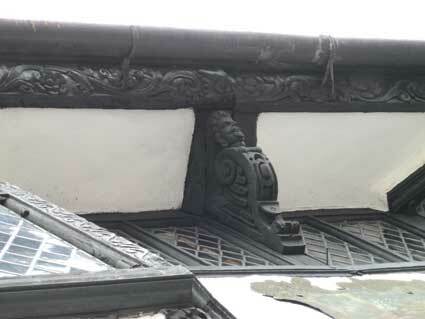 Below left: some of the decorative carving; below right: the dated beam. We only managed to capture the carved date by pointing a camera upwards and enhancing the images (it's in a rectangular frame at the upper left of the top image). See below for two further dated timbers from the Ipswich Museum store. 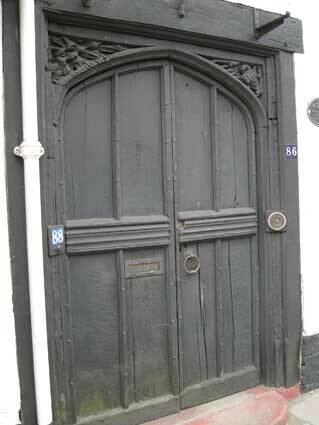 The rather handsome Neptune Inn front door, with its carved timber spandrels – hard to photograph without stepping into fast-moving traffic – has a doorbell which echoes a former incarnation as 'NEPTUNE ANTIQUES'. The carved spandrels of the doorcase show a grotesque face and a bird (compare with the Spread Eagle spandrels). 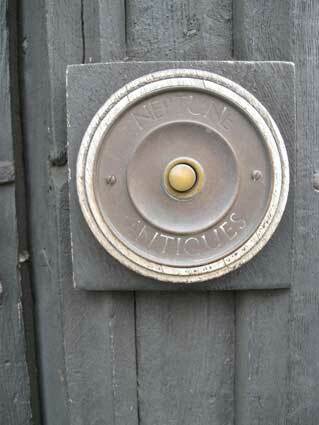 For much more on The Old Neptune, see Neptune Inn clock, garden and interior. Included here are a set of 2016 photographs of the complex, now used as accomodation for events and special occasions. 'The building is still to be seen in the parish of Saint Clements, a locality which once held a tremendous wealth of domestic architecture. The rear of the premises, formerly abutting on to the River Orwell, is the oldest portion of the structure while the front dates from the 1560s with additions later in 1639.' The engraving above is from Frederick Russel and Wat Hargreen's Picturesque Antiquities of Ipswich (published in Ipswich, 1845). 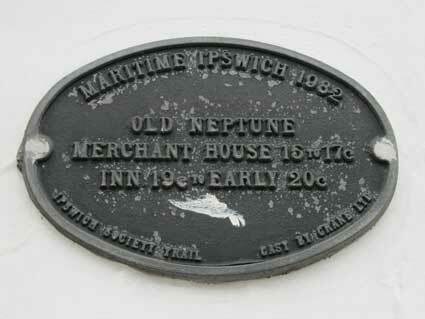 The Ipswich Society website (see Links) features the Fore Street Facelift 1961 section which includes a page of information on The Old Neptune in the 'History' section. 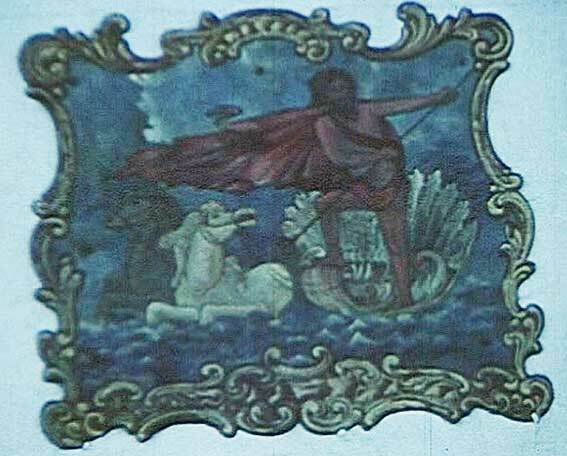 Here you will be able to download a PDF of the 1970 booklet about The Old Neptune published by George Bodley Scott and printed, of course, by Cowell's. For other early dates carved into the fabric of Ipswich buildings, try the newsagent's further up Fore Street ('1620'), The Captain's Houses ('1631') in nearby Grimwade Street, 6 St Helens Street ('1636') and The Old Cattle Market ('1620'). 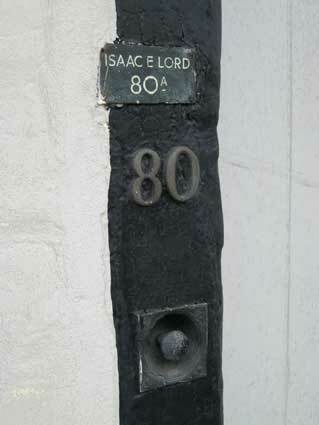 At number 97 Fore Street, almost opposite the Isaac Lord frontage, is a survivor from the days when this was the bustling heart of the town and proprietors were proud to display their names and trades on frosted glass shop doors. 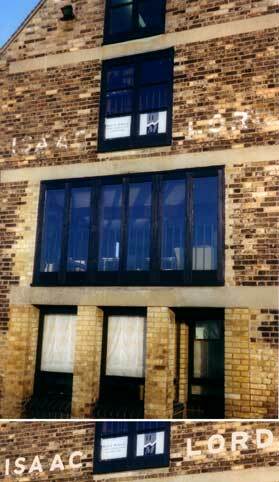 In 2002 this was the Labour Party Eastern Region offices. GROCER, TEA DEALER, & SHIP CHANDLER. One assumes that this might have been a previous business at the address before it became Jackson's Chemist. Charles Barker (sometimes Baker) is listed in local directories 1839-1855 at St. Clements, Fore Street. Charles has discovered: 'Mr. 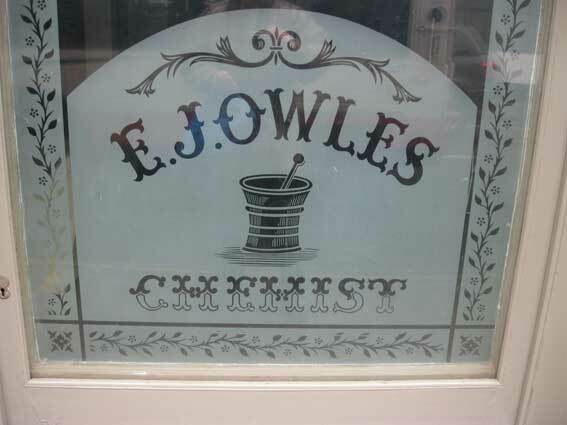 E. J. Owles, Ph.C, has removed his business from 55 Trafalgar Road, Greenwich, London, S.E., to No. 24 in the same thoroughfare. 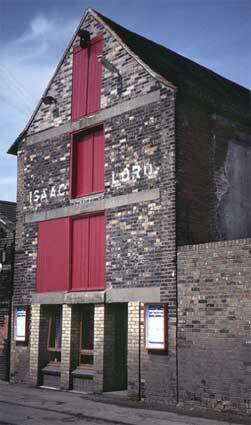 The former premises are to be pulled down and rebuilt.' This must surely make this shop-door the best travelled of all time. Just around the corner of 97 Fore Street - to the immediate right of the long view below - is a metal 'Maritime Ipswich 1982' plaque (cast by Crane Ltd) telling us that this was the site of the house of Thomas Eldred (1561–1624), circumnavigator of the world. 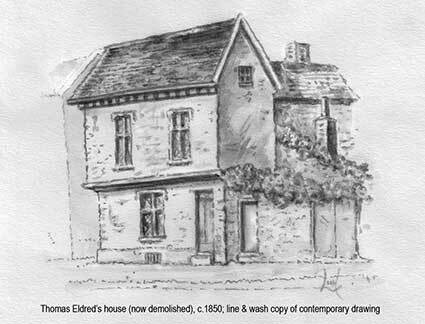 See below for line and wash drawing of the house. 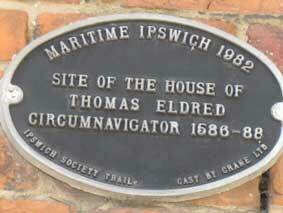 Eldred was an Ipswich merchant and mariner who sailed with Thomas Cavendish (1555- 92, also of Suffolk) on the second English circumnavigation of the globe 1586-88. Sir Francis Drake's voyage 1577-80 was the first. Certain features of the house were saved during demolition and incorporated into 'The Upper Chamber' in Christchurch Mansion. 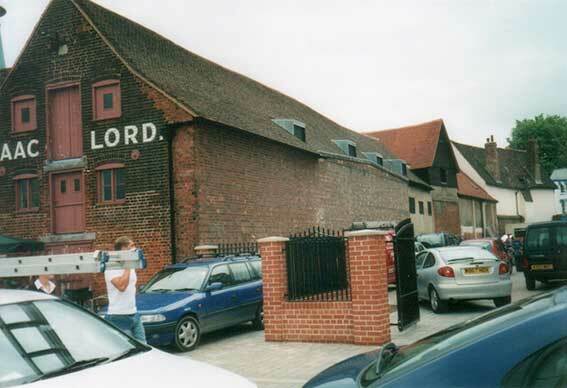 Eldred was also celebrated at 97 Cedarcroft Road, Castle Hill in Ipswich by a public house of the same name; this was demolished in 2012. Cavendish was born in 1560 at Trimley St Martin near Ipswich. His father was William Cavendish, a descendant of Roger Cavendish, brother to Sir John Cavendish from whom the Dukes of Devonshire and the Dukes of Newcastle derive their family name of Cavendish (see Cavendish Street). 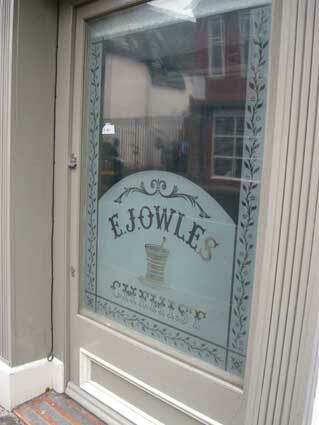 For other named chemist's premises see Symonds Chemist for a chimney sign and Hales Chemist for a doorstep sign. 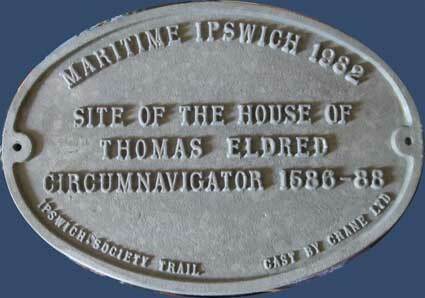 Tony Hill saved a set of unpainted castings of the Maritime Ipswich plaques, one of which is shown above. Crane Ltd made a spare set which have been used for research by the Ipswich Society. Architectural feature – the bressumer: a timber beam originally breast-summer (pronounced 'bressumer'). A summer or girder extending across a building flush with, and supporting, the upper part of a front or external wall; a long lintel; a girder. The difference between a bressumer beam and a lintel: a bressumer beam carries loads from above but has no window or door below it. Therefore its allowable deflection (long term or short loads) can be greater. A lintel on the other hand has a window or door below it and requires less deflection to ensure that the operation of the window/door is not compromised. A breastsummer is a summer beam; the word summer derives from sumpter or French sommier, "a pack horse", meaning "bearing great burden or weight"
This beam was taken from 98 Fore Street (along with a number of other timber features) before demolition. Its original date of '1651', the numerals standing in relief was changed changed from to '1771' by chiselling off the 'six' and 'five' and fixing two metal 'sevens' over the top. One assumes that the frontage was refreshed in 1771.